NO SURPRISE FEES! ALL TAXES, A/C FEES & CLEANING FEES INCLUDED! Tres Palmas is located right where you want to be! On the newer side of Bucerias at #43 Francisco I. Madero. We are a 3 minute walk to 7 miles of uninterrupted, beautiful beach! As well as blocks away from many fine restaurants, shops, art galleries and delicious bakeries. Casita Bucerias is a 2 bedroom/2 bath casita located on thefirst floor. 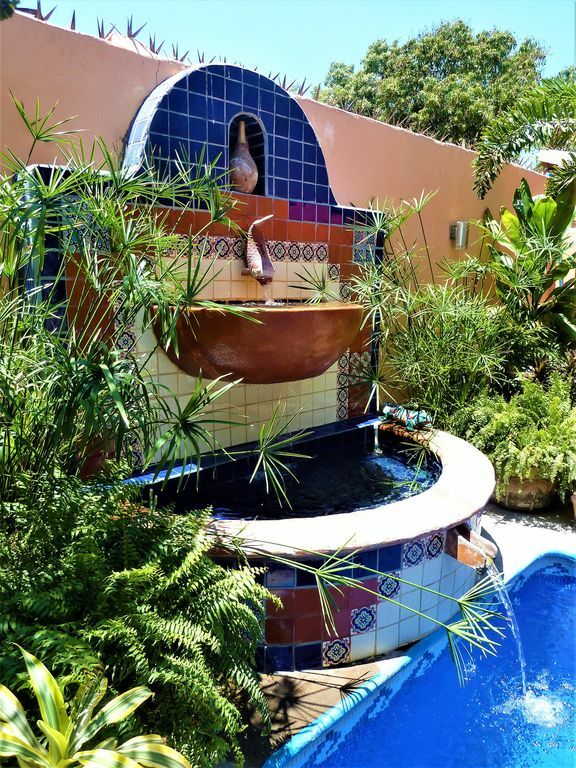 The casita is fresh and bright with a large, patio over looking the pool and fountain. The unit has air conditioning throughout, plenty of storage space and fully equipped kitchen. The master suite contains a king sized bed with attached bathrooms with oversized showers. The second bedroom has a queen sized bed. Our casitas are colorfully decorated with Mexican flare. Equipped with everything you need from kitchen blender to beach umbrellas. Maid service is provided 2 days a week. In addition to other free services on the property such as laundry facilities, purified drinking water, wireless internet, reading library, 40 flat screen tv with satellite, room safe, beach towels, chairs, umbrellas and Weber gas grill..
A three-block stroll away is Bucerias Centro with a lovely gazebo and church in the main plaza. But before you reach the plaza you will pass the artisans market, where you will be dazzled by the array of colorful items before you. Here you will find silver, ceramics, hand-embroidered clothing and so much more. If tropical flowers, beautiful beaches, and privacy in a lovely Mexican home sounds like your idea of Paradise, please join us by calling or emailing today so we can arrange your dream vacation. You will not be disappointed. Most units have double sinks! Remote controlled mini-splits in living room and bed rooms. We even provide towels for the beach and pool! Free on premises shared by our guests. 40" flat screen TV with with satellite and many channels in English. It's actually a cd library. Two heated pools with fountains. This was a great find! Grocery store, restaurants, and beach a few steps away. I was immediately attracted to the location. As I was looking at listings, I was drawn to the look and colors of the Casitas. We weren't disappointed when we arrived. Lisa greeted us and gave us a quick tour even though we arrived late at night (safe and quiet neighborhood). When we woke up in the morning the place looked even better. The colors so vibrant. The plants and vegetation in the courtyard is so beautiful. The beds are comfortable. Each bedroom has its own bathroom. Everything was clean and beautifully decorated. There is everything you need to go out to the beach like beach chairs, umbrellas, and even coolers. It’s really not far to carry it to the beach. Lisa is a GREAT host. She gave us great tips, advice, and recommendations. She is also great at reminding you that you’re on vacation, so just relax! Love her! I'm already thinking about our next trip and our stay at Tres Palmas! We throughly enjoyed staying at Tres Palmas. The casa was very nice and was supplied with everything you needed. We all loved the pool area and how beautifully esthetic it was. It is in the prefect location and close to everything you need.. Lisa was very welcoming and we would definitely go back. We thoroughly enjoyed our recent month long stay in Casita Bucerias. The 2 bdrm suite was what we were looking for in terms of relaxed local home living - a nice kitchen and of course, abundant beach chairs, umbrellas and yoga mats. Lisa is a great host attending to any and all questions. All of the units have uniquely different layouts. Our casita had a shaded outdoor dining area which was a perfect way to start or end each day. All five suites have access to a delightful pool which adds to the relaxed atmosphere. Tres Palmas is centrally situated in the Zona Dorada, the quieter side of Bucerias. It is a short 2 -5 minute walk from all types of restaurants and the beach. There is also a small grocery store nearby. You can safely walk anywhere in Bucerias - remember to see all the local markets or take the public bus to truly enjoy the local atmosphere. It is perfect holiday away from the typical crowds. Thanks Lisa for a great vacation. Great little place 2 blocks from beach and very accessible to many amenities! The garden/pool is sweet and private. Location good. Kitchen is well stocked. Drinking water dispenser a plus! Fit our 4 person family perfectly into the two bedrooms, each with their own bathroom. There’s a little noise from the road, but totally bearable. Laundry also a plus! Luna Luna across the street made a great breakfast. Lisa was very welcoming and and helpful. Staying here is recommended. Positive overall experience. Quiet, peaceful, clean and gorgeously decorated..a perfect oasis for a week of SUP on the Bay of Banderas. Highly Recommended! This was our first stay at Tres Palmas and we thoroughly enjoyed it. The castita was very clean and beautifully decorated and the kitchen well equipped with modern appliances. Washer and dryer in our casita. The pool area was very inviting with its fountain and comfortable lounge chairs. The property is located within walking distance of the shops, markets, restaurants and the beach. (Umbrella, chairs, towels, and a cooler ready for the trips to the beach.) A great place stay to explore Bucerias. Lisa is very accommodating of all requests. We will return to this property someday.